Walt Lemon Jr. kept the Bulls pouncing down the stretch as the Wizards 115-114. Lemon Jr. finished with 24 points and 8 assists in 29 minutes for Chicago in the win. Troy Brown Jr. scores 24 as the Wizards get the win over the Nuggets, 94-90. Get ready for Friday's top ten plays. Andre Drummond scores 32 as the Pistons are victorious against the Wizards, 121-112. Check out the top five plays from this Monday in the NBA. Taurean Prince scores 21 as the Hawks get the win over the Wizards, 137-129. Jordan McRae ends up with the loose ball in transition and finishes with the dunk. LeBron James scores 32 and Kevin Love adds a double-double of 28 points and 10 rebounds in the Cavliers win over the Hornets, 121-109. Kyrie Irving passes behind his back to Iman Shumpert for the triple. Played in 22 games with Phoenix and Cleveland…averaged 4.5 points on .436 shooting, including a .455 clip from beyond the arc in 8.9 minutes…in 15 games with Cleveland, averaged 4.1 points on .442 shooting from the field, including a .667 mark from deep, and 1.0 assist in 7.5 minutes…in seven games with the Suns, averaged 5.3 points on .423 shooting from the field, 1.1 rebounds and 1.4 assists in 11.7 minutes…was a 2016 NBA Development League All-Star after appearing in 29 games (all starts) for the Delaware 87ers; averaged 23.3 points, 4.6 rebounds, 5.2 assists and 1.7 steals in 35.5 minutes per game…recorded a near triple-double against the L.A. Defenders on Dec. 29, finishing with 27 points, 10 rebounds, nine assists one block and two steals in 36 minutes…poured in a then D-League record 61 points on 21-34 (.618) shooting, 11 rebounds, seven assists and two steals in 46 minutes against the Canton Charge…made his NBA debut on Jan. 29 against New York, tallying 12 points, two rebounds, a career-high four assists and one steal in 25 minutes…in his first appearance as a Cavalier, tallied eight points on 2-4 (.500) shooting from the field in seven minutes at Washington on Feb. 28…recorded career highs of 36 points, a 3-5 (.600) clip from deep, four rebounds and seven assists in 47 minutes against Detroit on April 13; became the first Cavalier rookie to score 35 or more points in a game since LeBron James recorded 41 points on March 27, 2004 against New Jersey…led or tied for the team lead with the Cavs in points once and assists once…was a DNP-CD 10 times this season (with Cleveland). 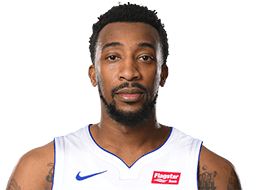 In 2014-15, appeared in 13 games (all starts) with the Delaware 87ers of the NBA D-League, averaging 18.4 points, 4.1 rebounds, 3.9 assists, 1.1 steals and 1.0 blocks in 34.4 minutes…averaged 21.0 points, 2.5 rebounds, 1.0 assists and 1.8 steals per game in the NBA’s 2014 Las Vegas Summer League…signed with Melbourne United of the NBL, averaging 19.9 points, 4.7 rebounds, 2.7 assists and 1.0 steals in 27 appearances…was acquired by the 87ers on March 5, 2015. Appeared in two games during the Cavaliers’ championship run in the 2016 Playoffs, averaging 4.5 points and 1.0 rebound in 2.0 minutes. Full name is Jordan Tyler McRae…son of Cornelius and Paulette McRae…in high school, was a 2010 McDonald’s All-American nominee and earned GSWA first-team All-State honors…was a four-star recruit coming out of high school…was a First-Team selection to the Atlanta Journal Constitution's 2010 Class AAA All-State Team as a senior after earning honorable mention as a junior. Played four years at Tennessee, averaging 13.3 points, 3.3 rebounds and 1.8 assists in 27.1 minutes…as a senior, started in all 37 games, averaging 18.7 points, 3.4 rebounds, 2.4 assists and 1.0 blocks in 32.2 minutes…was named All-SEC second team 2012-13…as a junior, appeared in 33 games (23 starts), averaging 15.7 points, 4.12 rebounds and 2.0 assists in 33.5 minutes…was All-SEC First Team…as a sophomore, appeared in all 34 games (15 starts), averaging 8.6 points, 2.9 rebounds, and 1.5 assists in 21.7 minutes…as a true freshman, played in 10 games, averaging 1.8 points in 5.3 minutes.